25 sq. yards of wool padding that is designed specifically for our wool carpet. 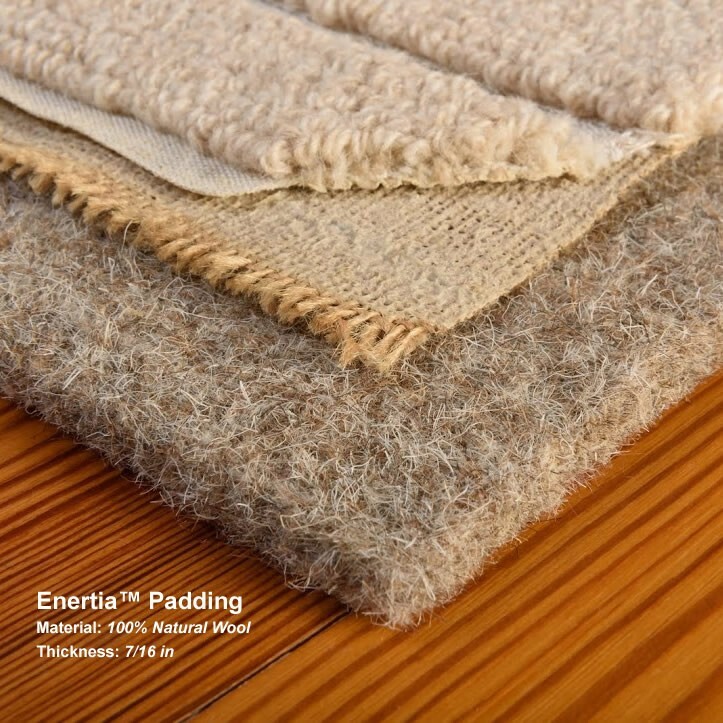 Wool-based Enertia™ Carpet Padding is a blend of coarse naturally pigmented wools mechanically needled (not glued) to a jute facing. Eighty percent of the wool fiber is pre-consumer waste. The padding is free from dyes, fire retardant, glues, moth proofing or adhesives. Color will vary from charcoal brown to tan, depending upon fiber availability. 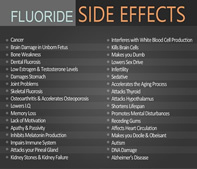 Some vegetable matter may be present. The average thickness is 7/16 inch, average weight is 40 oz/sq. yd. Each roll is 6' by 37.5' long—25 square yards. Cost of each roll is $236.25—only $9.45 per square yard —when you buy along with your carpet purchase. Padding purchased without carpet purchase will be at $303.75 per roll, or $12.15 per square yard. Individuals who have a sensitivity to animal fibers should obtain a sample before ordering. 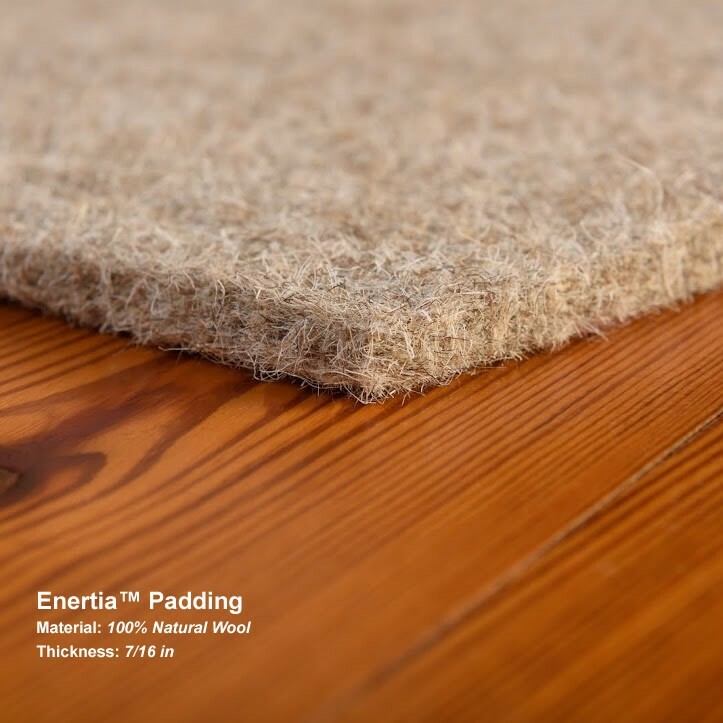 The padding has been designed specifically for our wall-to-wall carpeting. It is just the right density and firmness to provide the proper support and cushion to maximize the performance of the carpet. This padding should not be used without having our wool carpet covering it. 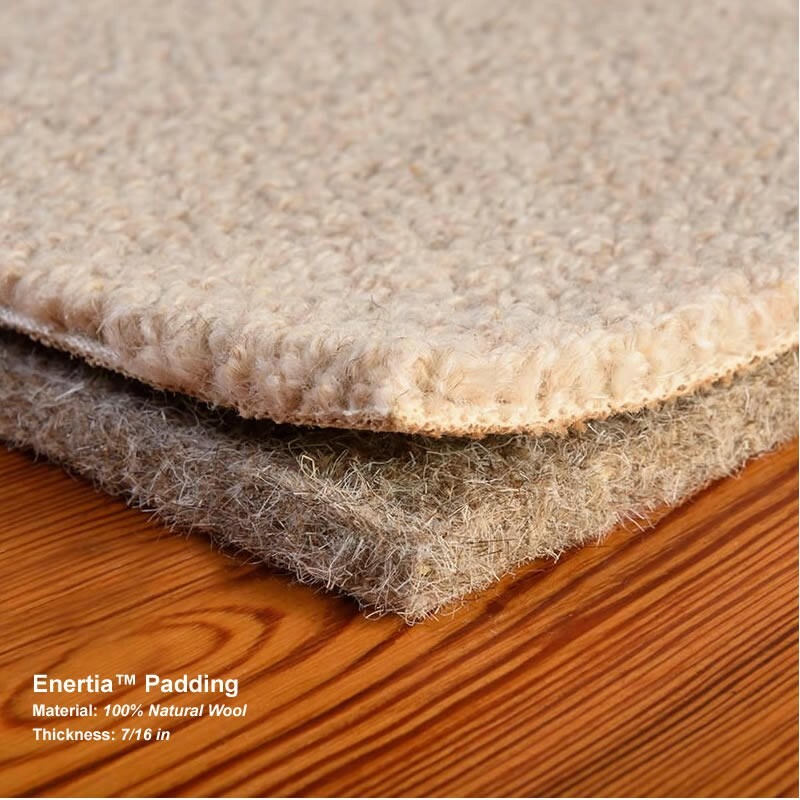 This 100% natural wool Enertia™ Carpet Padding will provide many years of use before needing to be replaced. When it does, we urge our customers to recycle it to the garden where it will safely biodegrade while serving as an effective weed barrier and mulch. Over a period of two to three seasons the padding will completely disappear, adding nitrogen and other nutrients plants need to the soil, essentially returning to grass. This wool padding has been designed to be used with wall-to-wall carpet only. It is not recommended to be used for area rugs. All Shipping is done by Freight and the cost for shipping can vary. If you want a shipping quote before you purchase the product please call (Toll-Free) 1-877-284-5042 or (outside USA) 248-585-8815. You may instead fill out our Shipping Request Form for Carpeting. Otherwise shipping will added on to your total purchase after the order is placed online and you will be contacted by our staff before the product is shipped for final approval. Shipping can take up to 2-5 weeks for delivery. You will also be contacted by our freight company who will set up an appointment to deliver the padding. Please note thatif you paid online at the price listed above and did not at the same time buy carpeting, Vitasalus will charge the higher rate of $270.00 per roll for the padding. We will make that clear when we contact you about shipping charges. Please Note: We strongly recommend contacting a professional carpet installer to come out and measure your area that you are looking to carpet before calling to get a shipping quote or placing a final order. This saves time, money, and dissappointment on your part; because in many cases each installer might have different ideas on how to carpet a certain area and may require a different amount of material.